Hello, I’m Riley Adams. I am 20 years old and live in a small town in Wyoming. 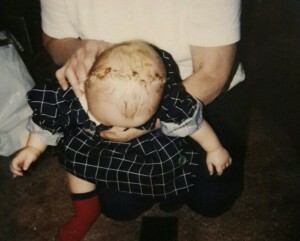 When I was 9 months old I was diagnosed with Multiple Coronal Craniosynostosis and had reconstructive surgery on my right eye socket and a metal plate was placed in my head to act as a soft spot, seeing as I was born without one. I really haven’t had many problems with my head after the surgery. I have had migraines as I got older. And because they had to rebuild my eye socket they clipped a nerve in my eye so I need to wear glasses now… not strong ones but it’s enough to make a difference. I don’t know If I should be telling you this.. but I guess it’s good to be ready for everything. I wasn’t really bullied in school. My mom made sure I thought my scar and surgery was the coolest thing ever and that’s how I’ve always felt. And the kids in my class thought so as well and totally took it as normal… it made me, me. But I did have a teacher in elementary tell me to stop being a screw head. Which even my class thought was out of line. Then other students from other schools thought that I had down syndrome… an acute case of it. They told me I looked like a pit bull. I don’t want to scare you, honestly I don’t. I guess I’m just letting you know it wasn’t all peaches and cream, but because I knew better and because I wasn’t embarrassed of my situation and I wasn’t self conscious their remarks didn’t affect me. Thankfully my mom helped me with that. She always was like, “You’re so cool you have metal in your head!” and other things along those lines. Thanks to her I have something I love talking about. I even took in my MRIs, Cat scans and X-rays in to my psychology class last year while we were studying the brain and got in front of the class to talk about it. I love my head and my face, it took me awhile to do so, but I do. I just want people to know that there is hope. I am living an amazing life, going to college to become a Physical Therapist so that one day I can work with the mentally and physically impaired children of America. I overcame expectations, and continue to live my life how I want to, not at the mercy of an old scar on my head. Don’t ever lose hope, things will be rough, but it will always get better.